​Because the French were on the side of the Americans, the populace became a little more comfortable with Catholic practices. The four French soldiers who died during their stay in Wilmington were buried out at Coffee Run with Catholic French Army Chaplains officiating." For nearly two centuries, the Cathedral of St. Peter has stood at the corner of Sixth and West Streets in Wilmington, Delaware. From its perch atop Quaker Hill, it has seen the maturation of Delaware's largest city; all the while it too has been growing and evolving. From a brick and tin roof structure measuring thirty by forty feet in 1818, St. Peter's is now the center of Catholic life and culture for a diocese that spans the Delmarva Peninsula. What follows is a brief history of how St. Peter's became the Cathedral it is today. Throughout the latter half of the eighteenth century, the Wilmington area was one of many stations on an itinerant ministry conducted by priests traveling on horseback from Philadelphia and Maryland. By the early nineteenth century, the burgeoning city was ready for its own church. Under the leadership of Father Patrick Kenny, land for the church at the corner of Hanover (Sixth) and West Streets was leased from the estate of Martha Whitelock in 1816. 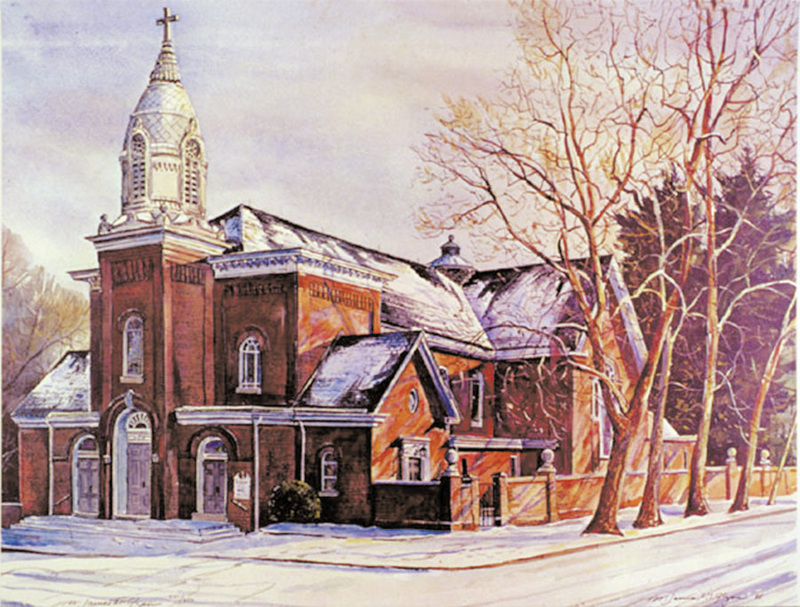 Over the next two years, the church was built, and on September 12, 1818, Father Kenny dedicated it to St. Peter. 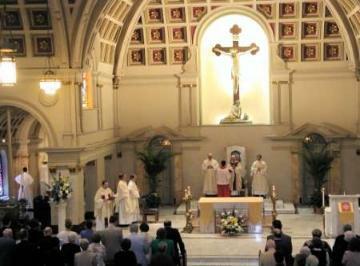 The "first congregational Mass in Wilmington for a vast concourse" was celebrated the very next day. A significant step toward this tiny church becoming a cathedral took place in 1868. Pope Pius IX established a new diocese that encompassed all of Delaware and the Eastern Shore counties of Maryland and Virginia. Up until this point, Wilmington was a part of the Philadelphia Diocese. With the diocesan changes in 1868, St. Peter's now stood in the heart of the new diocese's most populated city. Rev. Thomas A. Becker was named the first bishop of the new Wilmington Diocese and arrived at St. Peter's shortly thereafter. Between 1870 and 1905, St. Peter's went through a period of extensive enlargement and remodeling. The sanctuary and sacristy grew in size, and beautiful frescoes, stained-glass windows, and marble altars were installed. A cathedra and a barrel-domed roof were also added. Fresh off of these improvements, St. Peter's was consecrated as a cathedral in 1905. Church leaders and parishioners spent the next century growing as a congregation and as a community resource for those throughout Wilmington. All the while, they continued to maintain and improve the beauty and structural vitality of the Cathedral. Renovations took place in 1981, 1991, and 2007. During the work in 1991, twenty tons of the Cathedral structure were raised hydraulically (one twelve-thousandth of an inch at a time) to install a steel substructure for the pillars and choir loft.